"Inspired by architectural forms and topographical shapes in nature, I aspire to create works which combine the renderings of an architect with the delicate skills of a master jeweler. Employing multiple gages of gold and silver wire in varied tone, my works are distinguished by their 'see - through - spaces'. " 72 x 0.6 x 0.1 in. Left to Right: Necklace. 24k gold. Necklace. 24k, 22k, 18k gold, lapis lazuli. Serpentine. 24k and 22k gold. Bottom Left to Right: Necklace. Rock crystal, 24k and 22k gold. Antique Pearls. 24k and 22k gold. Roman, Syrian glass spheres (200 D.B. – 200 A. C.) found in Turkey or Syria. Chevron Pearls. 18th-19th century, made in Venice for Africa, slices 24k and 22k gold. Inside golden foxtail. Overall: 19” x 10” x ½”– multiple units/beads, of varying lengths. Longest is nearly 12” long. 1.2" x 1.26" x 1.67"
Carved ebony inlaid with 18k gold, black garnet druzy, labradorite sunstone, Australian boulder opal, 22k gold, rubber, sterling silver. Pendant. Auto primer on copper with patina. Black latex and sterling silver. Hand fabricated. Grey and white moonstone cabochons with spiral-cut green amethyst. Diamond topped rivets. In oxidised sterling silver. 1.6" x 3.4" x 1.6"
Necklace. 18k and 22k gold, opals, Mabe pearl, spinel cabochon. Silver, 18k gold, aquamarines, beryls. Ethiopian “Wello” opals, oxidized sterling silver, 18k gold (wire frames and hammered links), 22k gold (opal settings), 24k gold (fused to sterling silver). "When I choose a material I do it with the idea of ​​transforming it into a magical object. The object is capable of transporting the viewer to a personal place of his imagination. On this occasion I have used an experimental metal: mokume-gane titanium. Also known as Timascus. It is a challenge to work with because of its extreme hardness. Color change can only be manipulated with delicate temperature control." This almond shaped porcelain painting, laces the neck and caps the shoulders. Gold and palladium luster details. Omega Flowers is a translation of the paper flowers made by the Bloomsbury group. “The inspiration for my work is a very intuitive process, rarely figurative, mostly abstract. I’m very inspired by motifs with grainy aspects and crimps, stamps - often giving the pieces a 'galactic' look. Some shapes are closer to my wood-carvings and marquetry. Each object is sculpted and chased individually. I use solid gold. The material is very important - as important as the style and creativity. I sculpt in the mass, in the body of a 'forming' ring - without always knowing where I’m going with it. Sometimes, I take great risks... but this is also what gives so much strength to my jewels. Gems and precious stones appeal to me for their incredible spectrum of colors and their inherent mineral richness. It isn’t necessarily their monetary value that I look at, more their expressive value - sometimes symbolic - that influences the character of a piece. A vein, an inclusion, a veil, unexpected reflections or glimmer, a certain light or sparkle resulting from the way they are cut... all contribute to the personal, unique 'being' of each creation." "My work is inspired by traditional wire craft of Slovak tinker. In the 18th and 19th centuries, poor people from northern Slovakia used to travel around Europe, using a unique technology to repair pots and broken ceramics. They wired the broken pots together with nets. The tinkers' trade was a mans job because strong hands were needed to work with the wire. I wanted to find out how these traditional tinkers did their work. When I first started out, I used fine wire. What I discovered doing this was something rather different. To avoid pulling the end of the wire into the mesh, I just pushed the continuous strand through with my fingers. The structure of the net made this way looks knitted, while its transparency suggests lace. I come from a region of Slovakia where making lace is still a traditional occupation for women. So my work has both masculine and feminine elements to it." Seulgi Kwon received her BFA and MFA in Metalwork and Jewelry from Kookmin University , Seoul, Korea. Her work has been exhibited internationally in Australia, Canada, Germany, Italy, Japan, Korea,and the United States. Kwon’s sculptural forms are fabricated from silicone, thread, pigment and paper. The end result features the lightness of intricately colored and patterned silicone capturing the translucency of glass. "The word entezar in Persian language means expectation. The story of Entezar Ring is about a new life which is yet to come. It represents expectation, but the in patience, which asks for courage and strength, yet in the same time, it rewards the expectant for more than s(he) could even imagine. The miniature paintings and negative intaglio sculptures in citrine are representing the divine creation of the soul and the elements every soul inherits from it`s parents and progenitors. This ring`s story is about deeply intertwined connections between different worlds and existences and a proof that we are all fractal iterations of one primordial origin." "I delight in the magical surrealism of reality in nature. The designs are informed by studies of entomology, and life sciences, as well as experiences while living in the tropics and the desert." "The Drawing Series expresses my love for line, shape and the mark of a tool on a surface." Skyline Necklace Blue topaz, green amethyst, white moonstone, grey moonstone, rock crystal & chrysoprase cabochons. Rivets topped with faceted tsavorite garnet, rock crystal & blue topaz. In oxidised sterling silver. Arata Fuchi is a graduate of Tokyo Zokei University where he studied industrial design. He perfected his metal smithing skills at La Arte Orafe, (the Italian school dedicated to contemporary jewelry) receiving accreditation as a recognized goldsmith. Inventing a technique he called pulverization, which he often incorporates in his work, Fuchi continues to experiment and push the boundaries of what is possible in the field of studio jewelry. His ring, Liberation, illustrates Keum-Boo, another technique that Arata Fuchi has redeveloped and redefined. Keum-Boo is an ancient Korean gilding technique used to apply thin sheets of gold to silver, accomplished by first depleting the surface of sterling silver to bring up a thin layer of fine silver. Arata Fuchi then slices minute, thin strips of 24k gold foil which is then applied to thin wires of silver with heat and pressure.Then each formed gold sphere is fabricated to fit inside masterfully constructed oxidized silver frames and forms. 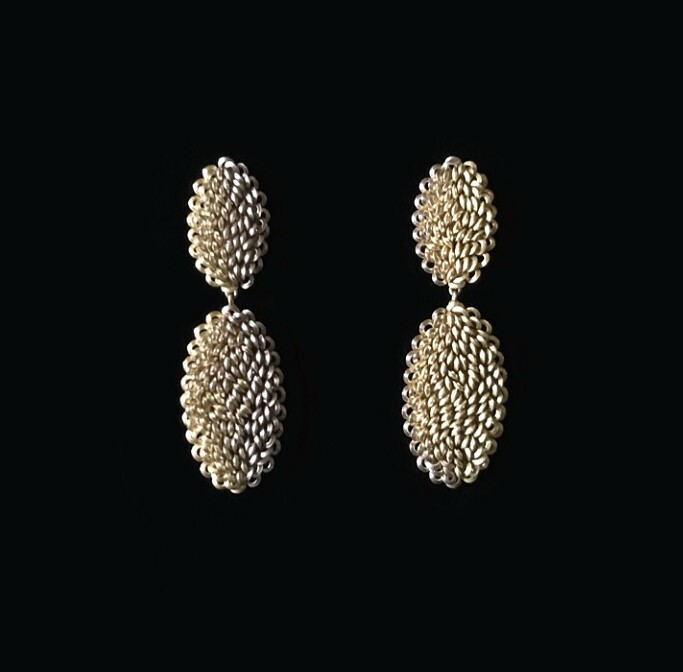 Hanne Behrens is a Danish artist who is known for her exquisite craftsmanship and the pure, clean lines of her designs. She studied under Arline Fisch and Mary Lee Hu and is a master of textile techniques such as weaving, knitting and plaiting, with gold and silver wire. In 2000 she was commissioned to make a brooch as a gift to Queen Margrethe of Denmark on her 60th birthday. 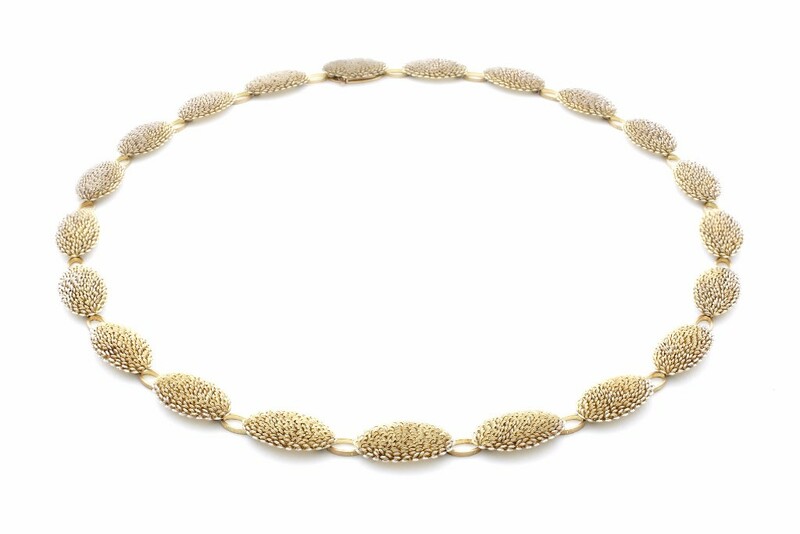 Behrens is the recipient of numerous grants and awards, including Bronze and Silver medals from the Best in Danish Craft and Design exhibition, and has exhibited in galleries and museums throughout Europe and the USA. Her work is in the permanent collection of the Museum of Fine Arts, Boston. “My work changes because of new techniques, inspiration and ideas. I tend to work best creating small series of related works, using the same technique but with different metal combinations, structures, shapes and surface treatments”. We are pleased to introduce her new Bubbles series collection featuring transparent circular forms with delicately woven metal threads of sterling silver and gold wire, including her continual explorations of her Seashell Treasures series. 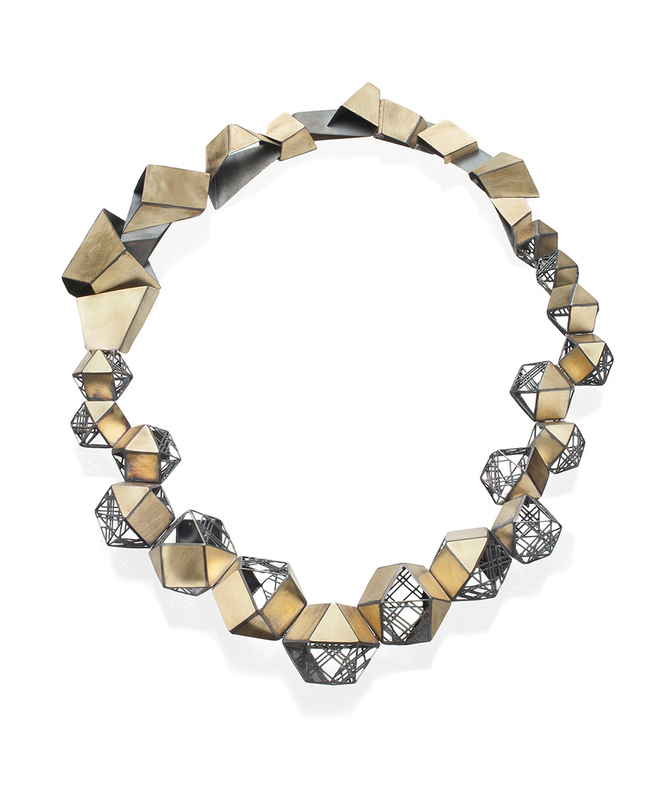 These two collections showcase her mastery of textile techniques with woven silver and gold. Necklace. 24k, 22k, 18k gold, lapis lazuli. Serpentine. 24k and 22k gold. Necklace. Rock crystal, 24k and 22k gold. Antique Pearls. 24k and 22k gold. Roman, Syrian glass spheres (200 D.B. – 200 A. C.) found in Turkey or Syria. Chevron Pearls. 18th-19th century, made in Venice for Africa, slices 24k and 22k gold. Inside golden foxtail. Necklace. Argentium silver, fine silver, 24k, 22k, and 18k gold, niobium, opals, moonstone, rutilated quartz, quartz crystal, sunstone, ammolite, freshwater cultured pearls, glass, enamel, moth wings, beetle wings. pure gold, gold foil, amethyst. The pieces featured below are a partial listing of the artists represented. MAKIKO ODA. Feel the Spring. 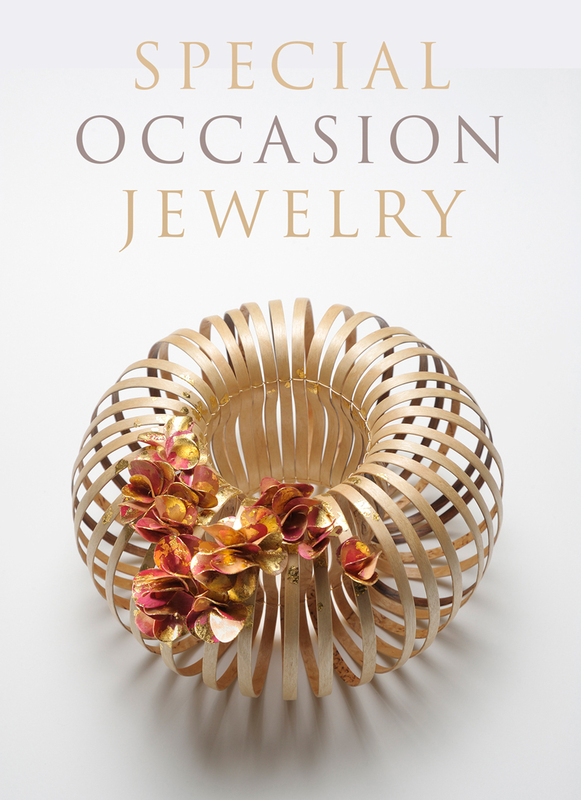 She has been recognized with the Excellent Use of Materials Award at the International Craft Exhibition, Itami, Japan and the Excellent Prize award at the Japan Jewelry Art Competition.